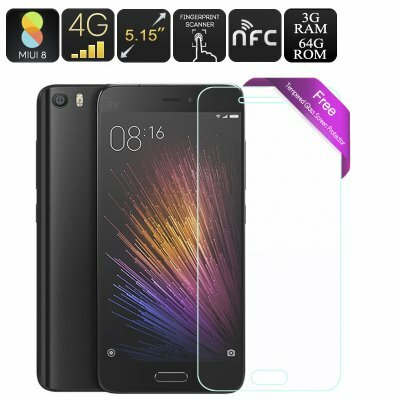 Successfully Added Xiaomi Mi5 64GB Smartphone - Snapdragon 820, 5.15 Inch Display, 1080p, Dual-Band Wi-Fi, 4G, 3GB RAM, Dual-SIM, 16MP Cam (Black) to your Shopping Cart. The 64GB version of the Xiaomi Mi5 has been tested as one of the fastest and most powerful smartphones out there, making this Android phone the optimal choice for those of you that are searching for a device that is capable of dealing with literally anything. Equipped with an extremely powerful Qualcomm Snapdragon 820 CPU that has been clocked at 1.8GHz, 3GB of RAM, and the Adreno 530 GPU this Android smartphone is capable of dealing with the most demanding of tasks as if it’s nothing. Backed up by an immense 3000mAh battery the Xiaomi Mi5 lest you enjoy all it has to offer for hours in a row, taking away the need and worry about recharging your battery throughout the day. Featuring 4G connectivity and Dual-Band Wi-Fi the Xiaomi Mi5 provides you with lightning fast internet speed no matter where you are. Download the latest Apps, games, movies, and more through Google Play in the blink of an eye and enjoy these in stunning quality on the phone’s 5.15 inch Display. With its 1080p resolution and 428PPI this Chinese smartphone truly lets your media come to life, providing you with a stunningly sharp and detailed image portrayed in vivid colors. Additionally, the display has been covered by Gorilla Glass 4, ensuring that the regular bumps and scratches throughout the day will form no threat to this smartphone. Running at the latest MIUI V7 Operating system the Xiaomi Mi5 offers you all the features similar to those held by the latest Android smartphones. NFC allows you to instantly and wirelessly transmit files or make payments with your Android device, immensely enhancing your overall user experience. Featuring Qualcomm Quick Charge 3.0 technology this Android phone additionally lets you charge your device in the blink of an eye, ensuring that low battery power and worrying about recharging your phone will be an issue of the past. Equipped with an amazing 16MP rear camera this Android device takes mobile photography to an entire new level. Anti shake, beauty, and face detection features allow you to snap mesmerizing pictures as if you were using a professional grade camera. Whether you’re enjoying a simple night out in the town or are taken away by breathtaking sceneries during your upcoming holiday – with the Xiaomi Mi5 you will carry around a professional pocket sized camera at any time. The Xiaomi Mi5 comes with a 12 months warranty, brought to you by the leader in electronic devices as well as wholesale electronic gadgets..